...the license will entitle you to acquire firearms, classified as curios or relics, in interstate or foreign commerce. You may dispose of curios and relics to any person, not otherwise prohibited by the Gun Control Act of 1968, residing within your state, and to any other Federal firearms licensee in any state. It must be emphasized that the collector's license being applied for pertains exclusively to firearms classified as curios and relics, and its purpose is to facilitate a personal collection. You may NOT engage in the business of buying and selling curios and relics under this license. What does this license do for me?A C&R license has several benefits to the M1 enthusiast. Your C&R license meets several of the requirements that CMP has for the purchase of an M1. Many vendors offer discounts to customers with C&R licenses. Finally, your license will allow you to purchase M1 Garands and other C&R weapons from other licensee's without the requirement of going through a third party and paying transfer fee's. 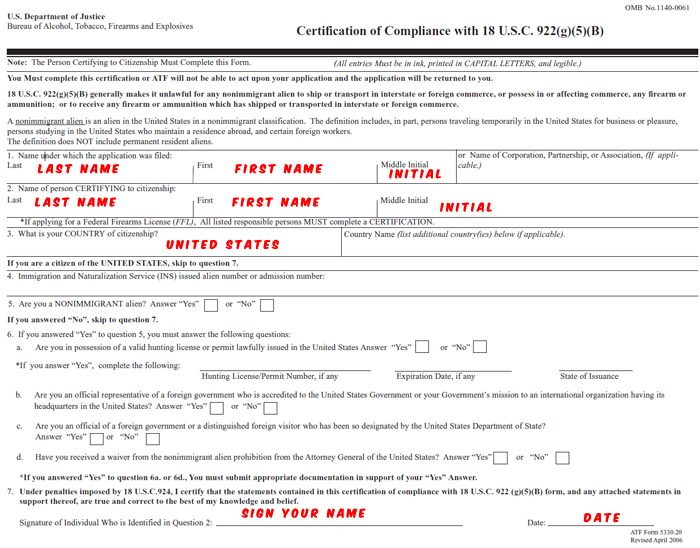 2 Download the [ATF F 5330.20 — Certification of Compliance] form. In addition to 5310.16, applications must be accompanied by a signed Certification of Compliance (ATF F 5330.20) for each additional Responsible Person (RP) on the license, if applicable. If you're the only person on the license then you don't need to submit the 5330.20 form. This one page electronic form is used to determine the citizenship of all the parties on the license and their eligibility to file the Form 7CR above. 3 The BATFE charges a $30 fee which is due at the time the application is filed. This fee covers the cost of your license for three years. You can pay this fee either by check or credit card. This article demonstrates a generic method of completing this application. Every person will have to answer the questions posed in the application according to their situation. Be sure to carefully read the questions on the application and answer them appropriately. 1 Sections 1 through 6 of the application are straight forward. Fill out the name, address, telephone and county in which you are going to collect at. We are going to assume that you are filling this application out as an individual and not as a corporation or other business entity. 2In section 7: Check the box marked An Individual. 3Section 8 deals with paying the $30 dollar license and application fee. We recommend paying by credit card when possible. You'll be able to monitor your credit card statement to know when your application has been processed by the BATFE. Checks or money orders are also accepted. Fill out section 8 and include your billing information. If paying with a credit card you must sign and date the printed copy of the form. Do not fill out the signature and date portion electronically. 4Section 9 is where you list the individual or persons responsible for the license. You'll have to include all your home addresses for the past five years, place of birth and date as well as a current phone number. The second column asks for your position. As a non-business entity you should enter "Collector", followed by your social security number. If you need more space then is provided on the form, use a separate sheet with your name, address and social security number at the top of the page. 5Section 10 is only filled out if you are a non-immigrant alien. 6Section 11 is used by the ATF to determine if you previously had a firearms license, or worked for a company that had. For most people this section will be marked NO. 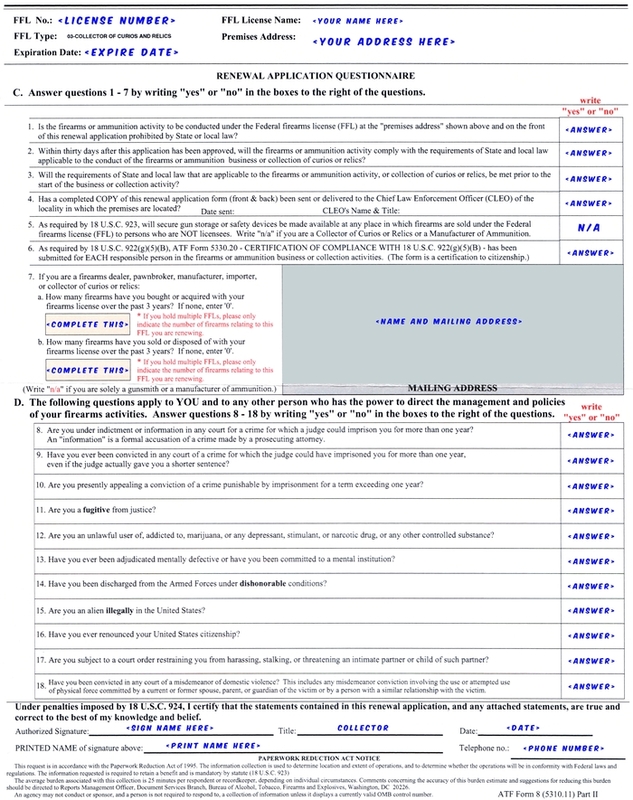 If you mark yes for any section you must include a separate blank page with a description of why you marked yes to the question. The top of the page should have you name, address and social security number. 7Section 12 and 13 deal with any criminal record, drug use, or restraining orders the applicant might have. If you mark yes to any of the questions you must include a separate blank page with a description of why you marked yes to the question. The top of the page should have you name, address and social security number. 8 The boxes in section 14 must be initialized. Do NOT check these boxes. Fill in the two sections for identifying your chief law enforcement officer. You city or county should have a web site with this information. 9 The final section of the application is section 15. This is the Certification part of the form. Sign the form with black ink. Under title enter "Collector" and date the form. 10 The second part of this application is called (Copy 2). This is an exact copy of the section you just filled out above minus the billing information. Complete this second part exactly as you did in the first part. This second part must be mailed to your Chief Law Enforcement Officer at the address you provided above. This is a requirement of the application. Your Chief Law Enforcement Officer is not required to take any action for your application to be processed. The CLEO only has to be notified that you are applying for the license. Print out both copies of the form, and verify the application is completed properly. When mailing your application to your CLEO it's advisable to include a cover letter letting them know why you are sending them the application form. A sample letter can be Downloaded here . The Certification of Compliance is a form the BATFE wants completed for any additional people listed on the license. ...applications must be accompanied by a signed Certification of Compliance (ATF F 5330.20) for each additional Responsible Person (RP) on the license, if applicable. 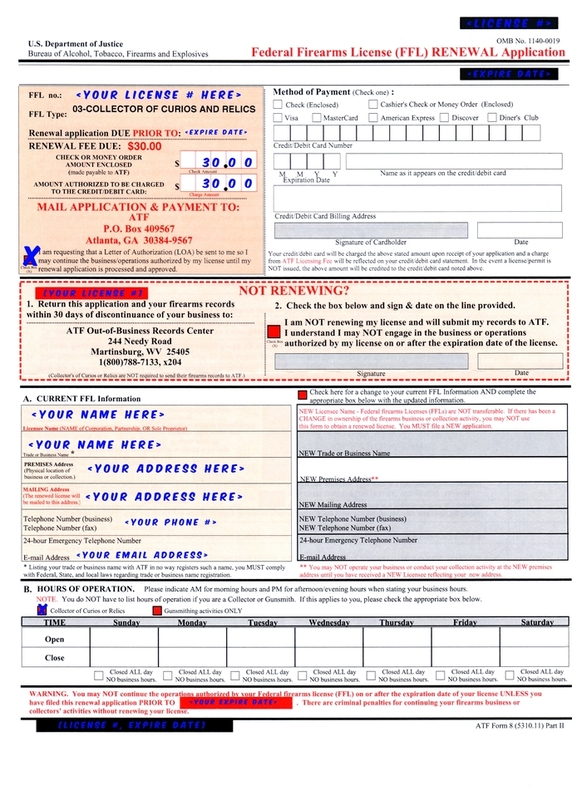 This form should be included with your C&R application if additional people are listed. It's a simple one page application. The Link to the form is included at the top of this article. Each additional responsible party fills out sections 1, 2, and 3 on the form. Complete the form by signing and dating section 7. Include the form/s with your application, if required. You do not have to include this form with your CLEO package. The average license takes between 60 and 90 days to arrive. When you get your license you will also receive a packet of information about your license including a list of firearms that are legal to collect. Each licensee is required to keep a bound book that lists your acquisitions and dispositions of any firearms you acquire. The BATFE may at any time request to inspect your book. Keep records of every transaction you do using your license! For the C&R collector the term "business premises" means the address of the license holder. There are PDF versions of the pages used in a bound book available online that a licensee can print out. However, we don't recommend you do this. A permanently bound book is a much safer form of record keeping. Should you ever get audited, it will look better when you hand the agent a organized bound book, instead of a stack of loose papers that could have come from anywhere. One bound book will last you a life time. Your C&R FFL License must be renewed every (3) years. The BATFE will mail to your registered address a renewal form (ATF Form 8 - 5310.11) 90 days before your license expires. Should you not receive a notice of renewal it is your responsibility to find out why and obtain one yourself. [Question] If a person timely files an application for renewal of a license and the present license expires prior to receipt of the new license, may the person continue to conduct the business covered by the expired license? You must complete the [ATF F 5330.20 — Certification of Compliance] form when submitting your renewal application. This must be done even if you sent one in with your initial application. If this form is not included with your renewal application it will be returned to you. This form is used to determine your citizenship and eligibility and it should be included with your renewal package. Fill out your renewal application without your billing information. Make a copy for your Cheif Law Enforcement Officer and complete the billing information. 1 Complete both sides (pages) of the form (5310.11) without the billing information as shown below. 2Photocopy both sides of the forms and set the copy aside. This copy will be mailed to your chief law enforcement officer. A cover letter for your CLEO can be Downloaded Here . 3Complete the billing information section on the orginal form.